Though many consider the 1906 Azusa Street Revival as the birth of modern Pentecostalism, speaking in tongues took place at two earlier Holiness gatherings, one in Topeka, Kansas, in 1901, and another in Cherokee County, North Carolina, in 1896. It is hard to say which is the oldest Pentecostal denomination. The United Holy Church and the Church of God (Cleveland, Tenn.) point to pre-Pentecostal roots as far back as 1886. The Pentecostal Holiness Church, with pre-Pentecostal roots as far back as 1879, was the first to adopt a clear Pentecostal statement of faith in 1908. Early Pentecostals claimed the gift of tongues was not primarily the speaking of a heavenly language (glossalalia) but other human languages (xenolalia). The purpose? Early leader Charles Parham said, “I had felt for years that any missionary going to the foreign field should preach in the language of the natives, and that if God ever equipped his ministers in that way [by xenolalia], he could do it today.” Though many anecdotes of xenolalia exist, none have been confirmed. Many early Pentecostals were pacifists. At the outbreak of World War I, some Pentecostals called for a “great peace council” at which they could state their opposition to warfare. Every major Pentecostal denomination has at some point adopted a pacifist resolution. Pentecostals have often been as stern as fundamentalists about social behavior. In addition to banning traditional vices like alcohol, tobacco, and the movies, they have targeted chewing gum, short-sleeved dresses, soft drinks, and neckties. Though most early Pentecostals came out of the blue-collar working class, the movement thrived among the poor and marginalized of society. Early Pentecostals taught a “theology of the poor,” interpreting their remarkable growth as God’s special favor upon the poor. Pentecostals found occasion to argue about most any subject, from prohibitions on pork to the correct doctrine of the Trinity. The result: today, worldwide, there are 11,000 Pentecostal or charismatic denominations. The largest church in the world is a Pentecostal church in Korea: the Yoido Full Gospel Church pastored by David Yongii Cho. 240,000 attend weekly worship. Two Pentecostal churches in Buenos Aires attract together 150,000 each week. Pentecostalism has become the fastest growing family of world Christianity. It is growing at a rate of 13 million a year, or 35,000 a day. With nearly a half billion adherents, it is, after Roman Catholicism, the largest Christian tradition. One of the main works on Pentecostalism is also one of the easiest reads: Vinson Synan’s The Holiness-Pentecostal Tradition: Charismatic Movements in the Twentieth Century. This revision of the 1971 The Holiness-Pentecostal Movement in the United States will likely be as influential as the original. Any student of Pentecostalism should own a copy of The Dictionary of Pentecostal and Charismatic Movements. It contains more than 800 entries (and 300 photographs) written and edited by the top scholars of Pentecostalism; it includes everything from biographical sketches to lengthy discussions of theological distinctives. An overview of the Pentecostal movement, including a brief history and summary of beliefs, is available at the New Religious Movements area of the University of Virginia’s Sociology department site. For a more academic look, check out the Cyberjournal for Pentecostal—Charismatic Research. 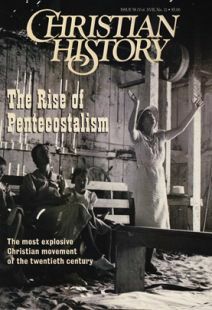 It covers Pentecostal history as well as current trends.